Just a question. In theory, if i wanted to delete the keyed ignition, I think I can simply insert a single toggle switch. According to the wiring diagram below, red and black are connected when the key is turned to "on." I can't make heads or tails of the other connection, brown-to-brown. What's that all about?? It looks like it is part of the lighting circuit to me as it spurs off towards the rear light. GeorgeSweety wrote: It looks like it is part of the lighting circuit to me as it spurs off towards the rear light. The brown wires are what power the tail lights. I read something about the ignition closing the circuit on the lighting, but in the diagram the lighting circuit is closed just as it comes out of the switch. WTH?? 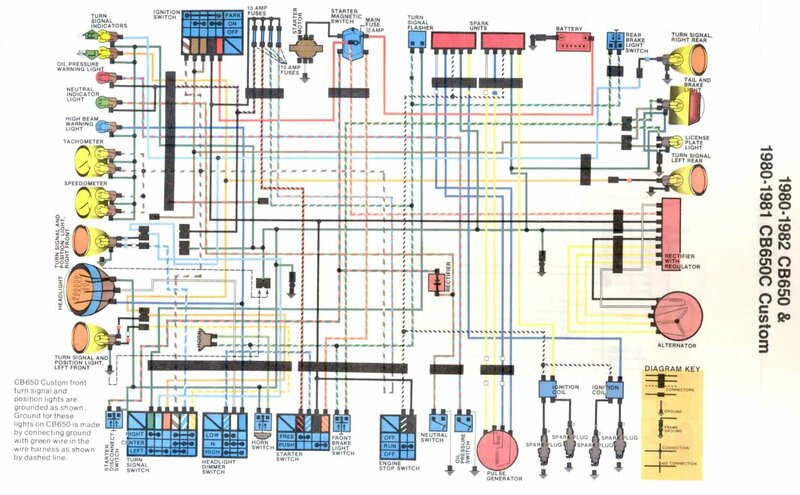 I think there is an error on the wiring diagram. As shown, it would do nothing. When I compare the wiring to another similar model (1978 CB750A) it makes more sense. "ON" connects brown to brown/white. "Park" connects hot to a second brown lead, which has a leg to the brown lead for the tail lights. Can somebody please confirm the 650 diagram is flawed? Hmmm. That is interesting. I'll have to look into this. It makes no sense to me, but I know that when you turn on the ignition, the taillights come on. It must be connected somewhere. If you want just a toggle switch, I'd say connect red to all the others. Is the taillight the only thing that comes on? When I turned my ignition switch on (US specs) the head, tail and daytime running lights all came on before the bike was started. As DRL's are not required in the UK I disconnected them in the front indicators and put UK switchgear with a separate light on/off switch. The only real difference that I could see with the wiring diagrams for a US v UK model apart from the switchgear light switch was provision for a position/ parking light on the UK model. The brown wire that goes nowhere from the ignition switch on the US diagram is the wire that goes to the position/parking light on the UK diagram. Here's where we have to follow some of these colored lines. If we connect the red to all the others, that includes the black wire. We can follow the black wire to the 10 amp fuses. I'm not sure the actual color of the wire coming off the second fuse from the left (on the diagram), but it looks reddish and black. You can follow it down to the starter switch. When the starter switch is free (not being pushed), that wire has continuity with the blue and white wire. We can follow it to the headlight dimmer switch. Here it has continuity with (depending on the position of the switch) either the high beam or low beam filaments in the headlights (as well as the high beam indicator light). Therefore, when you turn your toggle switch, the headlights will come on as well as the taillights. (tracing other wires will also show that the front running lights also come on). Going back to the starter switch, and it's need to be free (not pushed) for the light to come on: When you push the starter switch, it breaks continuity with the wire that will eventually power the headlight. This is to avoid having the headlight rob power from the starter motors during the start process. That's why you will note that the headlight goes out when you are starting.